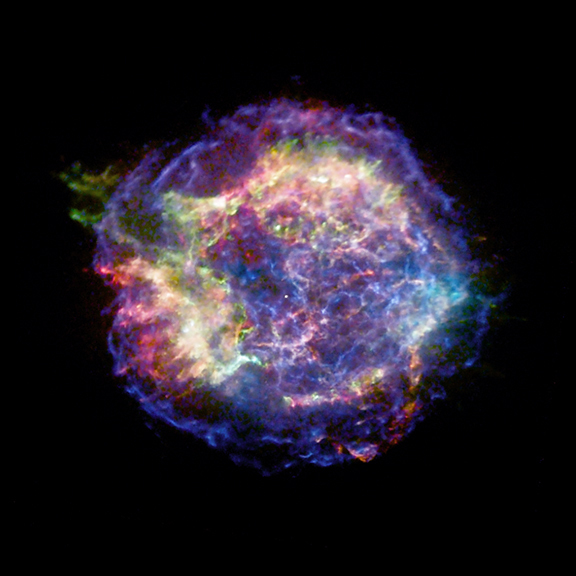 This new movie of X-ray data from Chandra of the supernova remnant Cassiopeia A (Cas A) was made by combining observations taken in January 2000, February 2002, February 2004, and December 2007. 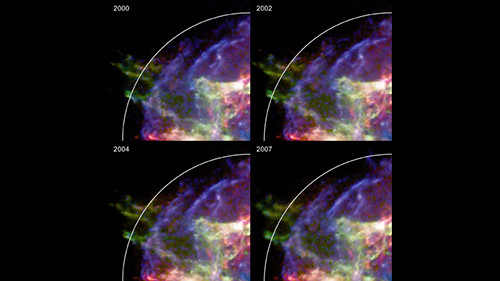 In these images, the lowest-energy X-rays Chandra detects are shown in red, intermediate energies in green, and the highest energies in blue. Scientists have used the movie to measure the expansion velocity of the leading edge of the explosion's outer blast wave (shown in blue). The researchers find that the velocity is 11 million miles per hour, which is significantly slower than expected for an explosion with the energy estimated to have been released in Cas A. This slower velocity is explained by a special type of energy loss by the blast wave. Electrons are accelerated to high energies as they travel backwards and forwards across the shock front produced by the blast wave. As the electrons travel around magnetic fields in the shock they lose energy by producing synchrotron emission and glowing in X-rays. Scientists think heavier particles like protons and ions are accelerated in the same way. The energy lost by these heavier particles can amount to a large fraction of the energy from the supernova explosion, resulting in a slower shock velocity. The accelerated protons and ions which escape from the remnant are known as "cosmic rays", and continually bombard the Earth's atmosphere. 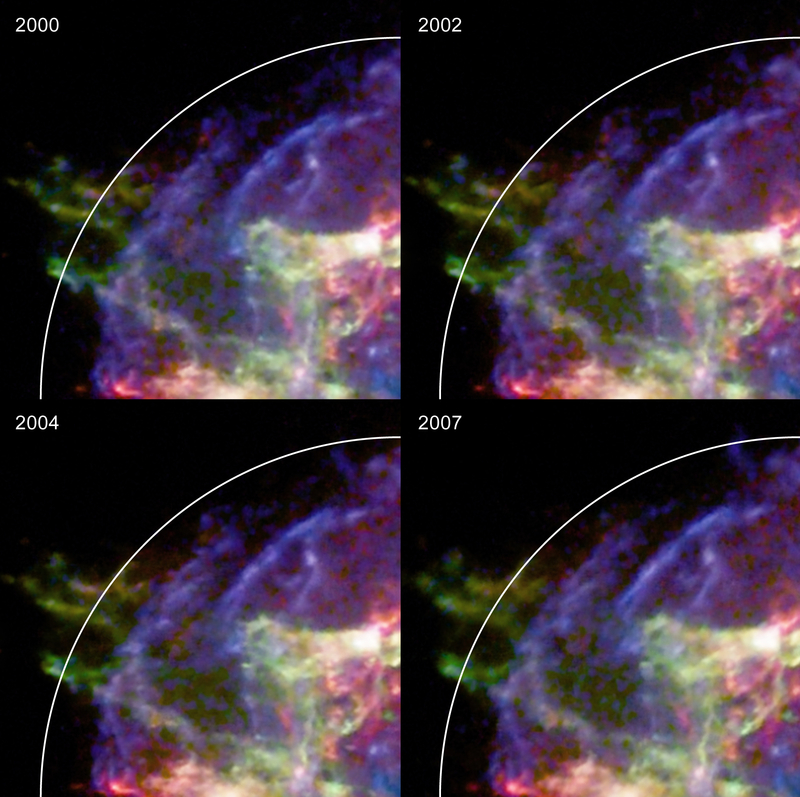 Supernova remnants are believed to be one of the main sources of cosmic rays. The authors have constructed a model that combined the measured expansion velocity, as well as its observed size, with estimates of the explosion energy, the mass of the ejected material in Cas A and efficient particle acceleration. 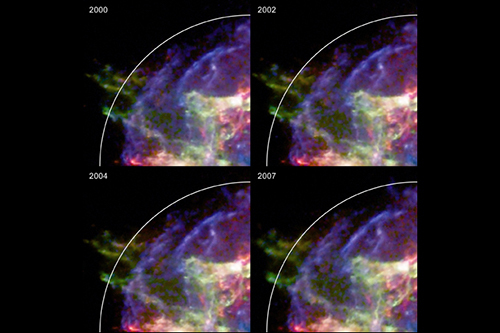 For everything to agree, about 35% of the energy of the Cas A supernova went into accelerating cosmic rays. Another new feature seen in the Cas A movie is "flickering" of the blue synchrotron emission seen on timescales of about a year. This flickering is thought to be a direct result of acceleration of particles to high energies, causing the emission to become brighter, followed by rapid cooling, causing the emission to fade. These variations provide important clues about the location of the acceleration, a topic of some controversy. For the first time, this flaring is seen in the outer blast wave. This casts doubt upon the possibility, suggested previously, that cosmic ray acceleration occurs in the so-called "reverse shock". This is a shock that travels backwards into the expanding remnant and is therefore located inside the outer blast wave. Previous claims that flaring occurs in the reverse shock may simply have been caused by regions in the outer blast wave that are projected onto the middle of the two-dimensional image. The rapid flickering not only gives information about acceleration of particles to high energies, but it also shows that relatively strong magnetic fields have been generated in the shock front.